On the back of one of the carte de visite photographs in the Georgina Auld nee Muir album is a photograph by Scottish 'Photographic Artists' John Adamson & Son. The Adamson studio is listed as 126 Sauchiehall Street in Glasgow, as well as Victoria Street in Rothesay. 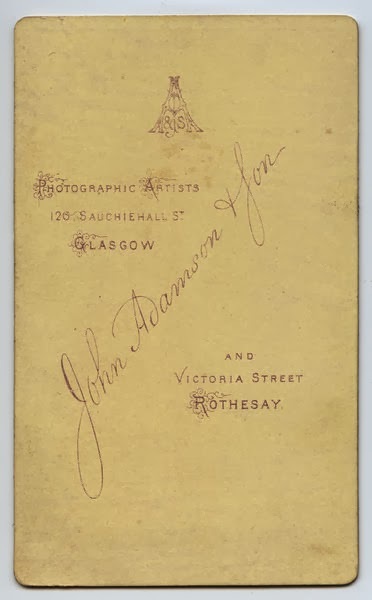 Researching through the Scottish Post-Office Directories for Glasgow, there is no listing for a John Adamson & Son in the 1871-72 Post-Office Annual Glasgow Directory under the name Adamson in the General Directory or alternatively under the list of Photographic Artists in the Trades Directory section. The 1872-73 Post-Office Annual Glasgow Directory has several entries for John Adamson & Son. Under the General section of the directory there is a listing under the surname Adamson. The father and son team are listed as photographic artists at 126 Sauchiehall Street in Glasgow. In the Street Directory section under "SAUCHIEHALL STREET", the above information is confirmed with a listing at number 126. Here John Adamson & Son are listed as artists, as opposed to photographers. There is no listing John Adamson & Son in the 1873-74 Post-Office Annual Glasgow Directory. In fact, according to the Street Directory section at 126 Sauchiehall Street, the photographer John Stuart is now operating from these premises. Currently the Scottish Post-Office Directories have available to view online the Bute County Directories for 1889-1912. Searching the first available directory, the 1889-90 Bute County Directory, which includes the areas Rothesay, North Bute, Kingarth, Port-Bannatyne, reveals John Adamson & Son are still operational in 1889. They are listed under the "Part II - Householders - Parish of Rothesay" section of the directory, and although they now no longer have their studio in Victoria Street, it clearly shows the pair are still operating their photographic studio at this time. The documentary evidence based solely on the information sourced from the Post Office Directories, dates the photo to between 1872 and 1873. Further research may be able to narrow the date range down further.